Home Videos World Guests Attacked By Real-Life Heat Rays - Not Science Fiction! 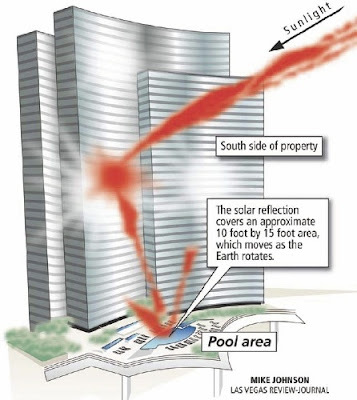 Guests Attacked By Real-Life Heat Rays - Not Science Fiction! Back in 1938, when Orson Welles scared the entire population of the US with the radio broadcast of 'War Of The Worlds' and he spoke about the martians' 'Heat Rays', he could not have know that more than six decades later, a hotel in Las Vegas would turn their own man-made heat ray onto their well-paying guests!! 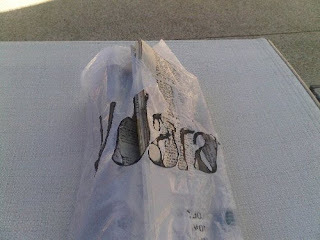 According to the Las Vegas Review Journal, the actual concave design of the Vdara Hotel is to blame. The all-glass front of the hotel reflects sun onto sections of the swimming pool area below. In fact, the temperatures are so hot that at least one man’s hair has been burnt and shopping bags and drink cups have been literally melted. Many guests have complained of being burnt by the powerful rays. One man, Bill Pintas, said that last month he felt extremely uncomfortable while lying by the pool. When he ran into the shade, he first smelled an odour and then realised it was coming from his head - his hair had been scorched. The plastic bag he was carrying had holes melted through it. Mr Pintas said, "It felt like I had a chemical burn. I couldn't imagine why my head was burning... Within 30 seconds, the back of my legs were burning. My first though was, 'Jesus, they destroyed the ozone layer' ". Another guest asked Mr Pintas, "it got you too?". One of the hotel employees said "we call it the death ray".